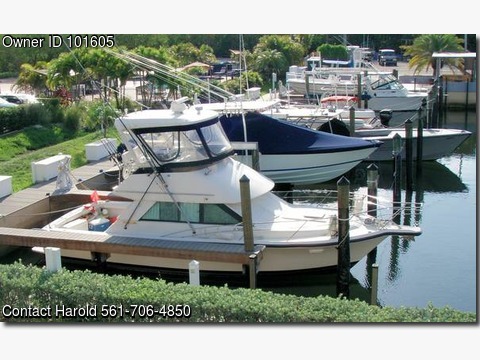 Boat is located in Boynton Beach,Florida.Please contact the owner @ 561-706-4850...PRICE REDUCTION! The Phoenix 33 SF is noted for it's big fishing cockpit, and a very space efficient interior layout plus great sea-keeping capabilities. The pocket props are excellent for shallow water Bahama cruising. With the outriggers, bait well and tackle storage, it is an outstanding fishing platform. It is powered by 385 HP Cat diesels Model 3126 with about 900 hours. Note these diesels are superior to the CAT 3208 and 3116 models. Engines and transmissions were installed in 2000. A RARE feature is the HARDTOP over the flybridge This is vastly superior to the normal canvas Bimini top. Many upgrades including new electronic battery charger, upgraded air conditioner, new bottom paint, and many more items. It has long lasting AWGRIP paint. Accommodations: The 34' Phoenix Convertible sleeps six in one queen island double berth in the master stateroom, two on the convertible dinette, and two in single berths with the convertible settee. It has a full galley and head with a separate stall shower. The cockpit is 144 square feet, has a transom door, live well, and engine access boxes. The fly bridge has two captain helm chairs, forward seating for three, plenty of storage, electronics include auto pilot, GPS/Fishfinder, VHF, and three sided isinglass curtains. The bow pulpit has an electric anchor windlass, Fortress anchor, and stainless steel bow rails with fender racks. An extra anchor rode plus a 200 ft additional anchor rode and chain included.